The southern end of The Lakes offers an altogether softer and calmer landscape. Here there are woodland walks and bike rides, and only 20 minutes away lies Windermere, the gateway to breathtaking scenery, wonderful tours and attractions.. For a truly green, relaxing and revitalising family holiday, you'll love Lakeland. Fill each day in just your own way - Every a typical day might begin with a lazy lie in or a Wake 'n' Shake session. 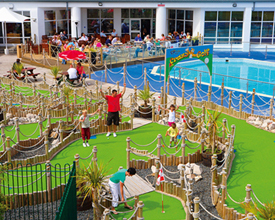 Maybe a morning in the Heated Indoor Pool, or round of Crazy Golf. 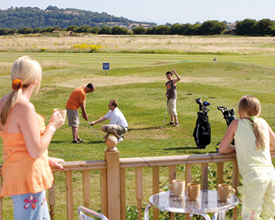 Lunch out locally ,or on Park in the Cafe Bar & Grill, ready for an afternoon on the 9-hole Golf Course, exploring The Lakes, or learning some fantastic Archery skills. Come evening enjoy a coastal walk or a sunset bike ride, before getting glammed up for a night in the ShowBar for an evening of entertainment with live music and dancing. 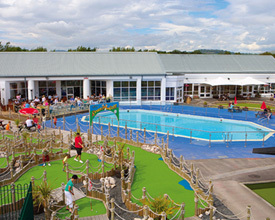 Lakeland Leisure Park offers the following facilities. This park Only 20 minutes from a cruise on Lake Windermere and its scenic splendours. Close by is Ulverston, a town ideal base for touring mountains of the Lake District and the waters of Morecambe Bay. The Lake District National Park is famous for its stunning scenery, abundant wildlife and cultural heritage. Enjoy a family ramble with a glorious backdrop of the Lake District National Park. The tranquillity of the fells, valleys and lakes give a sense of space and freedom and a release from the pressures of modern day life. These stretches of water are nationally important for their range of habitats, and species such as Vendace, Charr, Crayfish and Schelly. While the natural woodlands add texture, colour and variety to the landscape and also provide a home for native animals and plants. Holker Hill a popular tourist attraction has a hall, gardens and the Lakeland Motor Museum or why not take a trip on steam trains through the spectacular Haver Valley with the Haverthwaite Railway. 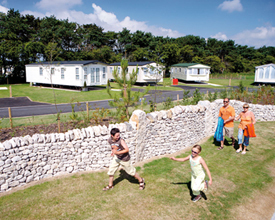 Have you been to Lakeland Leisure Park? Please submit your review so that others can benefit from your experience. Important note: Information provided here about Lakeland Leisure Park is based on our best knowledge. However, please check with Lakeland Leisure Park before booking to ensure that you have the information required. 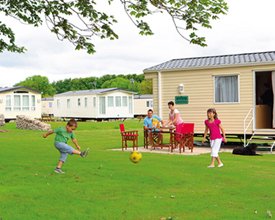 Reviews are the sole views of the contributor and do not necessarily represent the views of CampsitesandCaravanParks.com or Lakeland Leisure Park.